Harlequins and Gloucester shared 10 tries in an epic 39-39 Twickenham draw. The lead exchanged hands on several occasions before Harlequins fly-half Nick Evans missed a last-minute drop-goal to win the game for the hosts. A crowd of more than 70,000 enjoyed a feast of points, six of the tries coming in the second half after Gloucester led 17-15 at the break. Quins' Ross Chisholm and Gloucester's Henry Trinder both scored twice, while Rob Cook grabbed the pick of the tries. Both sides go away with a bonus point but neither were able to get the decisive score on a day which saw England captain Chris Robshaw return to Twickenham for the first time since his team's disappointing World Cup campaign came to a premature end. In a side-plot to the main event, England winger Jonny May limped off for Gloucester in the second half with an apparent knee injury. Jeremy Thrush scored the opening try for the visitors after seven minutes before Gloucester open-side flanker Matt Kvesic, who produced a man-of-the-match performance, played a pivotal role in his side's second try, scored by fly-half James Hook. 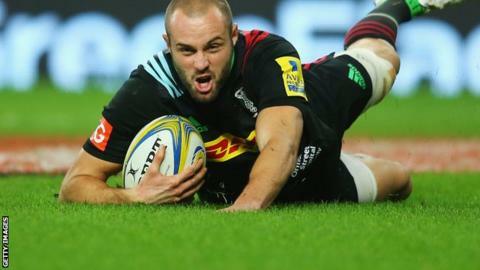 The Wales international then saw his fellow countryman Jamie Roberts inspire a Harlequins comeback on his first Premiership start for the club. Marland Yarde and Danny Care crossed in the first half for Conor O'Shea's men to put them back in contention. Trinder extended Gloucester's lead after the break with his first try before four action-filled second-half minutes produced three tries. Two went Harlequins' way, through Nick Easter and Chisholm, and then Trinder ran in his second, but pulled a hamstring in the process. Greig Laidlaw's penalty and Cook's dazzling run through the Harlequins defence seemed to make the win safe for Gloucester. But Evans kicked the home side to within a converted try and replacement Chisholm raced over once more to level it up again. Evans attempted a last-gasp drop-goal to win it, but his kick drifted just wide to the right. "We allowed him to be become too much of a factor in the game by not clearing him out. You could argue that some of the places he was coming from were interesting to say the least. "Luke Wallace came on and did a pretty good job at the end, but Matt was outstanding around the breakdown. "We know he is always a factor when you play him and we allowed him to become too much of one. Whether he gets a bit of leeway, you ride your luck when you are a seven." "I have no doubt that Matt Kvesic is an international player, an international number seven and the England seven-in-waiting. "He has got to produce those performances week in, week out, but when to comes to a big stage like playing at Twickenham in front of 70,000 - we talked about it before the game - big players produce big performances. "In the context of the occasion, but more particularly against who he was playing, that summed up where he is. He is ready to play international rugby. If you have watched our performances during the course of the season, he has played at an international level almost every week." Harlequins: Brown; Yarde, Lowe, Roberts, Visser; Evans, Care (capt); Marler, Ward, Collier, Horwill, Matthews, Robshaw, Clifford, Easter. Replacements: Buchanan, Lambert, Sinckler, Merrick, Wallace, Dickson, Botica, Chisholm. Gloucester: Cook; Sharples, Meakes, Twelvetrees, May; Hook, Laidlaw (capt); McAllister, Hibbard, Afoa, Thrush, Galarza, Kalamafoni, Kvesic, Morgan. Replacements: Dawidiuk, Murphy, Doran-Jones, Savage, Rowan, Heinz, Burns, Trinder.